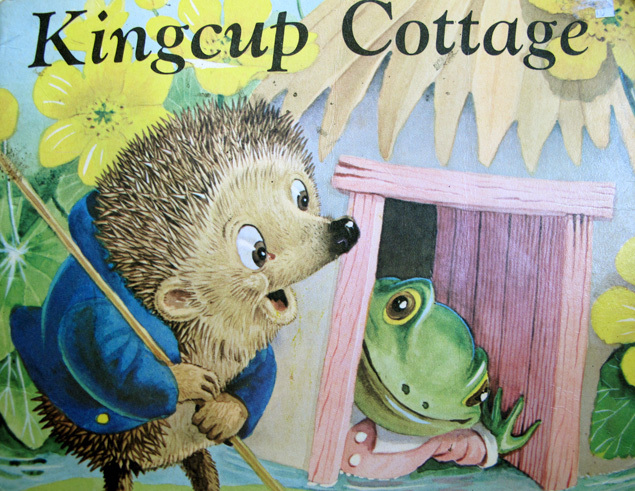 Kingcup Cottage was the first book I ever had. I still love it, and now get to read it to my boys. My mum lovingly kept a lot of our childhood books, so I get to relive all the pages again though reading with The Monkeys. And read we do. We always read a lot to, although their book case is getting mighty squishy. It hadn’t occurred to me until recently just how much food has always played a part in my life. Even going back to my childhood books, it’s the food pages that held my attention. The end party picture of Kingcup Cottage with the array of goodies spread out, and all the woodland animals tucking in. It’s the sort of picture that I would have spent a long time absorbing every detail of it all and scrutinizing each corner of the page. I’ve been subconsciously drawn to, so many pages in favourite early children’s books. It’s actually quite funny to look back as an adult and realise how I have come to these attractions or thoughts I guess, and how it has effected my way of thinking. 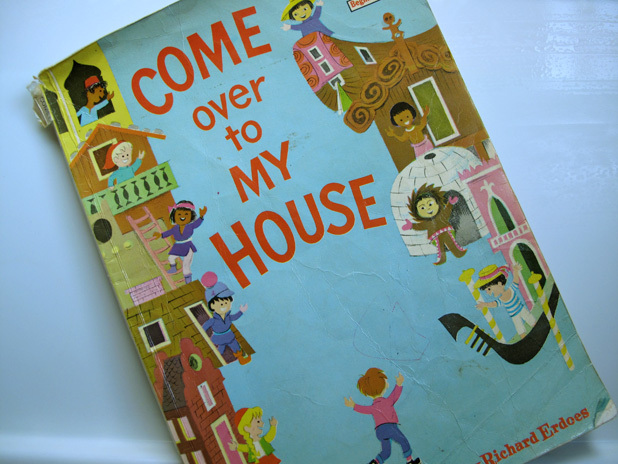 Back to early childhood books and ‘Come over to my House’- Theo LeSeig (pen name of Theodore Geisel aka Dr Seuss), was also another early favourite. It’s worn, frayed on the spine and still has oodles of love to give anyone that is drawn in by its pages. Each of those pages take the reader to a different country. I know that this book contributed to me wanting to know more about different cultures and countries from its colourful pictures. I aspired to eating spaghetti in Venice with the watery canals beneath my balcony and long gondolas silently polling by because of this page. I wanted to see the Northern Lights glow over a snowy landscape, and lie on a hammock on a tropical island feeling the balmy breeze between my toes. I’m still waiting to see the Northern Lights, but I have eaten spaghetti in Venice, and have felt that balmy breeze. I wonder what impact The Monkey’s books will have on them and whether they will be drawn to the foodie pages or something else completely? Did loved childhood books have a strong impact on you? This entry was posted in Rambles, Waffles and Digressions and tagged Come over to my House, Enid Blyton, food, kids books, Kingcup Cottage, midnight feasts, reading, Theo Le Seig by cityhippyfarmgirl. Bookmark the permalink. I read all of Enid Blyton’s book when I was a girl and loved them. My son’s favourite book was Whispering in the Wind by Allan Marshall, the man who wrote I can jump puddles. Whispering is an Australian fairytale about a boy who sets off to rescue the last beautiful princess who is being kept in a tower by her parents until she passes her exams. She is guarded by a dragon who squirts water because it is clean and wholesome and doesn’t leave a mess. I think it should be compulsory reading for all Australian children. It is out of print now, but worth looking for. I really love all the Australian kids books. Brydie, what a lovely, original post! As far as childhood influences food-wise go, for me it has to be The King, the Mice and the Cheese. “Everyone in the city could smell that cheese…” I swear it made a cheese lover out of me before I even really tasted proper cheese! Thanks Celia. 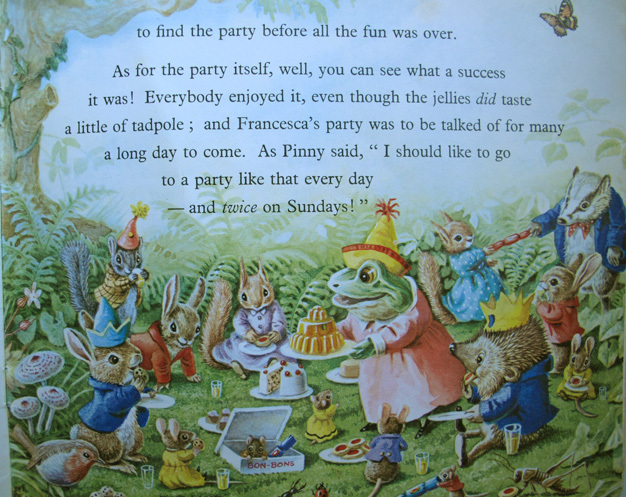 I adore childrens books, and could have rabbited on for quite a few pages as it really is close to my heart. I haven’t heard of the cheese book, I’ll have to look for that one too. Hee, hee. My wife loved Cloudy with a Chance of Meatballs when she was little. She must’ve been destined to marry me! Brydie I’ve been an Enid Blyton fan my whole life and I loved reading about the picnics enjoyed by The Famous Five and the midnight feasts in “The Naughtiest Girl in The School”. I was also fascinated by descriptions of blancmange and treacle tart in “The Magic Faraway Tree” and I SO wanted to meet Moon-Face and all the gang. Funnily enough, I ended up going to boarding school when I was 15 and we DID have midnight feasts which were a lot of fun. (The food was so bad we had to steal extra to survive)! I’ll never forget my introduction to stolen boarding school feasts – a repast of choc bits, jatz biscuits and toast made by ironing bread! Although it sounds disgusting (and probably was), at the time it tasted like manna from heaven! This so made me smile. I wonder how many kids wanted to go to boarding school because of Enid Blyton? I certainly wanted to go, how could you not when they were forever having so many adventures….and toast with the iron, seems like a much better option than regular ironing! Reading this was like wrapping myself in a warm blanket 🙂 I second so many of your thoughts and experiences with books (including, I’m pleased to say, the food-related focus and memories – I’m glad it wans’t just me!). I enjoyed many of your list, and I hope if I ever have children, I can re-live the fun by reading some of my childhood favourites to them. I’m incredibly grateful to my Mum for giving me a love of books and reading. Kari, I’m greatful for that too. I really enjoy reading to The Monkeys, watching their eyes get bigger, as they snuggle in a little closer and you wonder what it is they are taking in from it all. Try as I might, I just can’t see it being the same reading from something digital. I never read Milly Molly Mandy. I love hearing all the other books people were drawn to. My favourite childhood book was Dr Seuss’s “Green Eggs and Ham”, and I read it every time my sister and I went to our local library. And then recently while visiting my son in America, I had the opportunity to read it to my granddaughter, Emma. Her eyes were as big as saucers as it read it to her, and within the week she had nearly memorised the entire story. She’d quote the end of sentences to me; I’d read half of the sentence and she’d finish it. She’s only 3-years-old but clearly this is still a book that fascinates at all age levels. Thank you for the memories of childhood books! Misk that’s lovely… I’ll bet your granddaughter will associate that book with you for a long time. i adore this post. my dad always read us poems by shel silverstein. they are wacky and silly, not my usual taste in children’s book, but the we them love up. also his book “the giving tree” really stands out from my childhood. Kristi have you seen any of Banjo Patterson’s kids books? They are old now, but I loved them as a kid, and my boys now do too. Might be something different for your lovely boys. Enid Blyton really was the bees knees. Sooo many books that she wrote. I hope your kids love that magic too. I’m so happy this post has touched a nerve with so many people. And I love that I’ve now found two others that loved “Come over to my House” as much as I did. ….I might have try that iron trick, just to see how it works…. The Bobbsey Twins, Famous Five, Biggles were all books that fueled my dreams and let my imagination thrive. I have fond memories of my early reading experiences and feel so lucky that my parents somehow introduced me to the wonderful world of books. Parents play a huge part in the love of books don’t they. I feel sorry for kids that miss out on that magic that lies between the pages. Yes! Food in children’s book was always a definite draw for me. Heidi, now you get to be a part of that book journey with the little boys in your life. I think that’s really special. glad it prompted some happy memories. Beautiful reflective post Brydie. I was a voracious reader as a child, even pretending to turn on the taps in the shower so I could forgo personal hygiene to have a few more quiet reading moments to myself. Books like Alice in Wonderland, Wind in the Willows, Peter Pan and the Lion the Witch and the Wardrobe always drew me in with their wonderful imagery and writing. I’ve since returned to these books as an adult and there is so much more there to consider – for one, Peter Pan is full of themes of death and dying! I must take a sneaky peek at ‘Come Over to my House’ when next I see you – make sure the bathroom is free and the taps are running in preparation! The first book i ‘could read’ was ‘One Fish Two Fish Red Fish blue Fish’ by Dr Seuss… I had learnt the rhyme but I was under the impression by the age of three that I was actually reading and I remember how good that feeling was . I ‘read’ it to every visitor that walked in the door. I also loved Enid Blyton …. and also had midnight feasts and ‘lashings of ginger beer’ , even though I didn’t like ginger beer. I was also always on the lookout for suspicious smugglers and already had plans of how I would catch them all by myself. Remember Trixie Belden?? – I had all 22 of her books and I read them over and over and over. I fancied myself as a 13 year old detective and was always on the lookout for a mystery to solve. The annoying thing was that nothing ‘mysterious ‘ ever happened!! Computers can never replace the magic that is in your own head when it is sparked by a good book. Thanks for a magic post , it brought back lots of fun memories. I’m so glad it brought some magic to you Kim. I remember well Trixie Belden. Any detective books at that age I was all over. The Three Investigators was another series I loved…gosh, actually anything with pages I read! I adored Enid Blyton as a child. Firstly her “Magic-Far-Away Tree” books and then her “Famous Five” series – and they always seemed to have exciting picnics with “lashings of lemonade”! A lovely post Brydie. I loved books as a child and love them now too. I loved enid blyton and now my daughter does as well. Thanks Mrs Bok. My boys are a bit too young for most Enid Blyton books, but I really hope they will love her as well. Brydie, just love the sound of that Rhubarb and blueberry crumble. Rhubarb is a hit in this household as well and the kids seem to love it! As for children’s story books, I had a limited few when I was small. But I think my neice and nephew has certainly made up for it. Lovely post. I remember the Faraway Tree as a young girl..I always wanted to go to the land of ‘Eat what you want’ with Bessie and co. The jellies and cakes, toffees and so on..what bliss this would be! I love the whole notion of absorbing treats through our favourite book characters and even though it may be hard to identify now, I’m sure these books are making subtle impacts on your monkeys and their views on food. Break out the ginger beer and pop-biscuits! The Faraway Tree was such a lovely book. I never have tried to make a towering plate of moulded jelly… perhaps it’s time. Childrens’ books are so special and I spent a happy half hour looking up these ones, what a lovely post. I have been known to track down old books just for the sake of holding them once more and visiting with them. Some are surprisingly badly written when you meet them as an adult, but some will last forever. I wasn’t an Enid fan, though I did read some of them, and my sister burst into tears when my Dad looked up from his paper one morning and said she had died.’ No more storie!,’ sobbed my little sister and was inconsolable. My nephew reads to me sometimes if I have been good, he is seven now and is reading well. I still have quite a few of my beloved kids books but they are all falling apart which makes it harder to share them with sylvia. I loved my humphrey book and the berenstein bears and of course dr seuss. Strange how lines from these books come to mind at the oddest moments! Many books I loved I didn’t own but must have read at the library or at friends a lot. 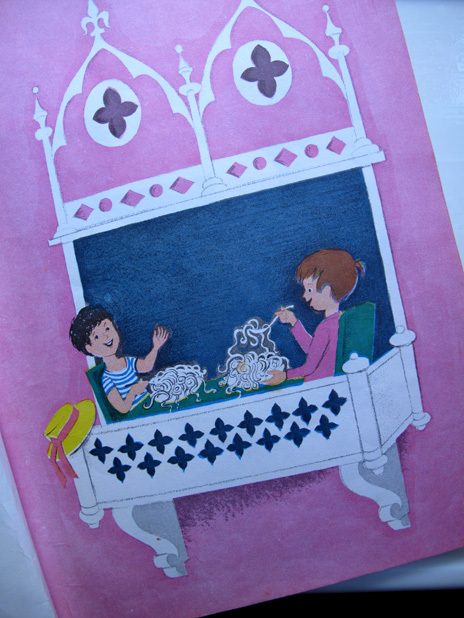 I loved Shirley Hughes illustrations. That Come over to my house seems to ring a bell – does it have kids sleeping on the roof – that was one of my favourite pages if it is the same book and it was what I dreamt of doing! I LOVE kingcup cottage, I still have my copy and you have made me want to get it out and read it to the girls. Such beautiful beautiful illustrations, and I love the fly biscuits. I’m glad there was someone else out there that remembered this beautiful book. I loved the fly biscuits as well, they always reminded me of brandy currant biscuits that my mum used to make. They are beautiful pictures aren’t they.